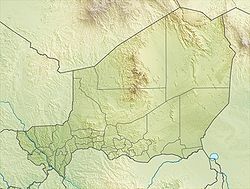 The Echkar Formation is a geological formation comprising sandstones and claystones in the Agadez Region of Niger, central Africa. Its strata date back to the Late Albian to Late Cretaceous (Cenomanian stages, about 100-95 million years ago). Dinosaur remains are among the fossils that have been recovered from the formation. ^ Weishampel, David B; et al. (2004). "Dinosaur distribution (Early Cretaceous, Africa)." In: Weishampel, David B.; Dodson, Peter; and Osmólska, Halszka (eds. ): The Dinosauria, 2nd, Berkeley: University of California Press. Pp. 571-573. ISBN 0-520-24209-2. ^ Brusatte, S. and Sereno, P.C. (2005). "A new species of Carcharodontosaurus (Dinosauria: Theropoda) from the Cenomanian of Niger and its implications for allosauroid phylogeny." Journal of Vertebrate Paleontology, 25: 40A. Young, Mark T.; Alexander K. Hastings; Ronan Allain, and Thomas J. Smith. 2017. 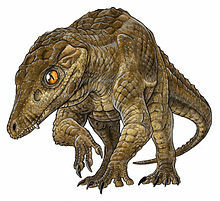 Revision of the enigmatic crocodyliform Elosuchus felixi de Lapparent de Broin, 2002 from the Lower–Upper Cretaceous boundary of Niger: potential evidence for an early origin of the clade Dyrosauridae. Zoological Journal of the Linnean Society 179. 377–403. Accessed 2019-02-21. This page was last edited on 3 March 2019, at 14:49 (UTC).